As a psychotherapist, I work with individuals and couples every day to help them create change in their lives. Similar to a hiring a personal trainer, people come to me to do what they have difficulty doing on their own. What I help people with isn’t always new, e.g. “We’ve been talking about my emotionally distant father for months now!” but I do provide another perspective: listen intently and empathically, and help my clients feel accountable to themselves. Again, just like a trainer. So as a strong believer in the mental health benefits of regular exercise (guys, it’s literally a built-in antidepressant and anti-anxiety pill), I am constantly returning to the metaphor of how emotional and psychological change is just like the physical growth and change you experience through exercise. Here’s how it works: Everyone knows that if you want to get in better cardio-vascular (heart) shape, you need to experience some degree of sweating, panting, increased heart rate, and fatigue. It isn’t that different with the psychological mind. If you want to heal your emotional heart, you need to experience sweating (crying), panting (expressing strong feelings of anger and sadness), increased heart rate (some feelings of anxiety in the body), and fatigue (feeling emotionally spent post-therapy sessions). Everyone has heard the phrase: “No pain, no gain.” While I do not wish physical or emotional pain on anyone, I do tell all my clients that in order to experience real sustainable change, they MUST be uncomfortable. That’s why I often warn my clients who are just starting out in therapy that they may initially feel worse before they feel better. No, this is not a marketing strategy. Rather it’s how I communicate my prediction that as they grow, they will experience discomfort. How many of you have looked at your personal trainers and asked, “Seriously, are you trying to kill me?” Although a few trainers might be sadistic, most of them are trying to show you all that your body is capable of in a way that you could never know for yourself. That’s what I do in therapy. I show my clients their limitless possibilities if they simply dare to do things differently. 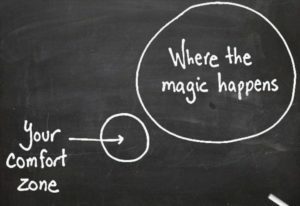 My favorite quote about therapy is Neal Donald Walsch’s “Life begins at the end of your comfort zone.” Do you notice change when you’re running the exact same distance you’ve been running for the past five years? Or do you notice it when you run one minute longer? Do you feel most emotionally alive and healthy when, for 25 years, you continue to try to please your critical mother? No, you feel most alive when you stop hustling for her approval, manage the physical discomfort of fear in your body, and feel proud that you were courageous enough to do it differently. Another quote that I believe explains psychotherapy in a nutshell is Henry Ford’s “If you always do what you’ve always done, you’ll always get what you’ve always got.” Trainers all over the world will tell you that doing the same exercises over and over again won’t create body change. What will it create? Overuse, fatigue, and injury. Emotions are the same way. When we only utilize the same emotional tools over and over again (e.g. responding angrily and defensively when our partner shares a complaint with us), we feel like we’re on a treadmill. We’re both frustrated, exhausted, and emotionally injured. When we’re brave enough to try something new (e.g. expressing our sadness that we’ve disappointed our partner), we learn how to flex and build other muscles, thereby getting off that automatic treadmill that wears us down and prevents us from finding resolution. So, the next time you feel the emotional pain of exploring feelings in therapy, just remember that without some discomfort, no change or healing can occur. Just as our physical body demands us to push ourselves just outside our comfort zone, so too does our emotional life.